Amazima is so blessed to be so well supported by so many. However, at this time we are not accepting volunteers to come and help with the program. The Amazima board members are traveling to Uganda this spring to help out with the ministry, and we will keep the website updated with any volunteer needs that may arise. To find out how else you can partner with Amazima, visit the "How to Help" and "Projects" pages at Amazima.org, or contact Gwen or Suzanne at gwen@amazima.org or suzanne@amazima.org. I love reading your blog and having my good, ugly cry. You are on my heart and in my prayers daily. I am the mother of two little girls and reading the story of your little girl leaving and then coming back was so precious. YOu are such a gift to those children and to all of us who read and are blessed to hear your story. I am a friend of Gwen. I wish I could have met you when you were home. I tried, next time. My husband and I are going to start supporting your ministry. Bless you. I found your blog through a random search and have been so blessed with your testimony, your stories, your "living it out" faithwalk in Uganda. I have begun lifting you and yours up daily in prayer and I count it a privelege to go to the Father on your behalf! Be blessed in your obedience...it blesses me that you are in the midst of raising up little missionaries for Uganda in your own home there! Keep seeking and serving....others are seeing Him through YOU! I was introduced to your blog by a friend, and I can't stop rejoicing, crying, and praying as I read it. I just KNOW that God has an amazing plan for each and every child that you meet and take care of. Thank you SO much for being willing to do whatever God wants you to do. After reading your blog, I turned around and told my mentor about your blog, and she is doing a sermon at my youth class at my church about you, your ministry, and how God can work through anybody and anything. I have the privilege to get up on stage to explain about your ministry. I hope that I will have the same willingness as you when God calls me to do something crazy that will change people's life. I just wanted to let you know that you aren't only making an impact in Africa, but also here in Texas. I am praying for you. And again, thank you. Just wanted to stop in and let you know how much I admire you and your ministry at such a young age. I'm fairly new to the blogging world, but we have similar hearts, and I think we would really enjoy corresponding with each other! I invite you to stop in and take a look! I'm a freshman at Cedarville University so i heard about you and your ministry in chapel this morning. I just read a bunch of your blogs and i think it is amazing what you're doing! Keep glorifying God in everything you do over there :) You are a true encouragement to me. Thank you so much for sending Katie to do your work in Uganda. her blog has on your people. Thank you for being a loving servant of our Lord. Thank you for giving your youth to bring Jesus to these young children. What a joy to read your blog. Katie, my husband and I are adopting from Ethiopia and I found your blog while surfing other's adoption blogs. I was captivated the first time I read one of your posts. I am truly amazed at how surrendered you are. God is doing an incredible work in you and through you. You're an encouragement to me and so many others I know. Thanks for being sold out to Jesus. God's work in you is changing lives. I hope your ministry grows and grows and grows and reaches hundres more...all over Uganda...all over Africa. God is that big. Keep pressing on dear sister. Blessings and prayers to you!!! You don't know me...I am sorry this comment is so long. I know you have little time for emails, so I am posting this as a comment. I am sorry for the time it will take to read it...But my God inspires me to tell you what is on my heart. I suffer from eating disorders. I know, in a country full of starving people, you probably hate me just now. But of all of the people in the world, I felt you would look at my sickness with understanding,because you are full of God. As I read your posts, I am filled with The Spirit. Along with your eloquent writing and your amazing story, it is feeling that Spirit that keeps bringing me back. People have told me that God understands me, my sickness...but I didn't understand THAT until I had read your blog. Reading about His love in the lives of you and the people of Africa makes it all make sense,and I begin to understand that God loves and knows me, too. That HE made me, HE gave me pain and suffering...but only because he loves me. Pain and suffering are a part of this life, and a part of His plan. For days, I have eaten very little. I was so hungry today (I feel foolish even saying this, because the children and people you see daily would make my feelings of hunger look like I had just had a feast!) but I have been unable to eat. I have been at your blog for hours, reading and feeling The Spirit. And now, for this moment, I am able to eat. 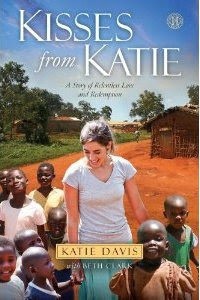 Katie, you are touching so many lives in Africa, but I want you to know you are touching other's lives, too. For this moment, you have changed my life. Because of you, God was able, for a moment, to touch my soul and lift my spirit, and for this moment,I am healed. In Him, the sick are healed. I wish I could be like the people in Africa when they came to your home and thanked you for the school supplies. I wish I could fall and your feet and thank you! Instead, I will fall at His feet and thank Him FOR you. As I have been writing this, tears have been pouring down my face. I have not felt so wonderful in a long time. Katie, THANK YOU. Really. You are an amazing young women. What you are doing in Uganda is a true testiment of the love you have for Jesus!! You are an inspiration to all of us~ I will keep you and your children lifted up in prayer!!! !